For over 64 years, Koberstein Contracting has built our reputation on successfully meeting the challenges of the toughest site preparation and commercial excavating projects. Koberstein Contracting can combine the right equipment with our highly skilled crews and project managers to ensure that your project is of the highest quality, within budget and ready on time. We have a history of excavation successes that range from landfills and retail development to highways, power plants, and industrial complexes. Koberstein Contracting provides the highest quality of service for just about every type of commercial, industrial and municipal excavation project. Koberstein Contracting’s experience and focus on superior quality in site development has made us the leading utility installation contractor in the region. 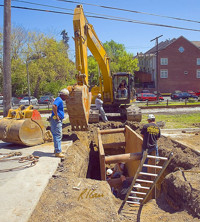 We’ve installed thousands of miles of underground utility piping including sanitary and storm sewers, waterline and related structures consisting of lift stations, box culverts, and manholes. Koberstein Contracting has highly skilled crews and project supervisors to handle utility installation projects including extensive modernizations and expansions to complete new system installations. We utilize a variety of materials and applications to complete commercial, industrial, and municipal projects to the highest quality, within budget and on schedule. We have the highly trained team and capabilities to efficiently and safely complete all types of demolition. With our large fleet of equipment, we can handle the demolition of houses, buildings, wood and steel structures and manufacturing plants and more. Our highly skilled team can successfully remove trees, pavements, underground utilities and other site features to prepare your site for new construction, and in a safe and cost effective approach.